Even though the relentless rain and flood has brought a damper to the Alappuzha Nehru trophy boat race, the land is going to witness a enthusiastic gathering both from international and domestic regions. As most of the areas in Kuttanad are under flood water, it has surely decreased the flow of tourists. The trial run of the participating snake boats was conducted at the Punnamada Lake and other water bodies at Kuttanad a day ago. According to official information, around 72 boats which include 22 snake boats would take part in the boat race which is slated to be held on Saturday. The 62nd Nehru Trophy boat race will be inaugurated by Kerala Governer Sheila Dikshit at Punnamada Backwaters at 2 pm on 9th August 2014. The occasion will be blessed with the presence of State Ministers, local MPs, MLAs and other special invites. The race will be flagged off at 3.15 pm with all the participating boats put their maximum strength to clinch the title. The distribution of the prizes to the winners is scheduled to conduct at 5.30 pm. With 2,000 policemen including top most officers will be deployed in and around the venue giving out tight security. Special seating arrangements have been made to accommodate 17,000 people. This Boat Race will witness the gusto of oarsmen, the steep excitement of the spectators along with the rippling waters and the ostentatious boats. After the whistle blows, the meek waters of the Punnamada Lake would become a track on fire while its calmness is broken by the striking oars. For this boat race, a mechanised system will be installed at the starting point to end inveterate complaints that the manual structure often results in foul starts. Descon, the consultancy wing of the Department of Ship Technology, Cusat has recommended an electric motor and winch mechanism in the place of the hand-operated lifting drum which is being currently used. In order to prevent boats from coming over the starting area, another cross bar-pillar type mechanism is being installed behind the starting block. The new system will ease concerns of foul starts and delays during the boat race. 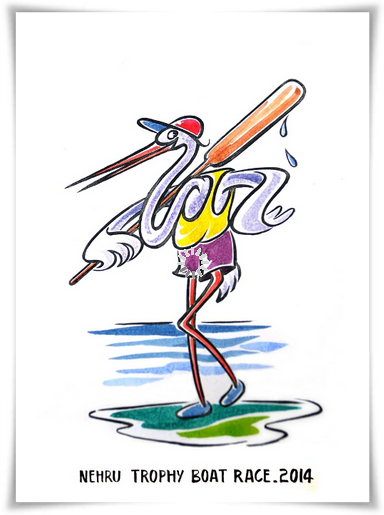 The logo designed by V R Reghunath features a crane holding an oar is the lucky charm of 2014. Viewers should reach Alappuzha before 11 AM and occupy the seats, as boat services will be not be available after 12 noon. Tickets for viewing the boat race as fixed at Tourist Gold Rs 2000 while Rs 100 for Lake view. Even though, watching the boat race right in front of your eyes is most preferable, but if really passionate not to miss the event, various TV channels and websites are arranging live telecast and webcast. You can watch the 62nd edition of Alappuzha Nehru trophy boat race live on various news channels like Asianet News, Kaiali TV, Manorama News, India Vision, Mathrubhumi News, DD Malayalam, Reporter TV, TV New, Surya TV and Amritha TV. Watch Aranmula Vallamkali(Boat Race) 2014 live streaming/online webcast on TV channels or the website http://www.aranmulavallamkali.in/. The heats and final of Aranmula Vallamkali 2014 will be reported on Asianet News, Kaiali TV, Manorama News, India Vision, Mathrubhumi News, DD Malayalam, Reporter TV, TV New and Amritha TV. In 2014, the event is being conducted on 10th September. Being the oldest boat fiesta in Kerala, the Aranmula Vallamkali and Vallasadya attracts people from various places.